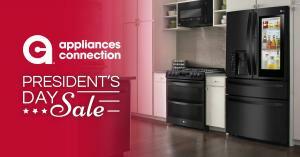 Through February, save on the finest home goods at Appliances Connection's 2019 Presidents Day Sale! BROOKLYN, NY, USA, January 29, 2019 /EINPresswire.com/ — At Appliances Connection, you won’t have to wait until the middle of February to save for Presidents Day. What’s more, we’ve got so many deals, they can’t be contained to just one day. We’re running our 2019 Presidents Day Sale from February 1st to the 27th. Appliances Connection is already known nationwide as the home goods retailer with the most competitive pricing. During our month-long Presidents Day Sale, we’re making our great deals even better. You can save up to 65% off select products throughout our site. We offer a full range of appliances from dependable brands such as Whirlpool, Electrolux, Samsung, and Bosch as well as the height of luxury including La Cornue, Miele, SMEG, Dacor, and Monogram. We also carry the finest in furniture from manufacturers such as Coaster, VIG, Modway, and ACME. When you buy 2 appliances, save $60.00 instantly. When you buy 3 appliances, save $150.00 instantly. When you buy 4 appliances, save $250.00 instantly. When you buy 5 appliances, save $400.00 instantly. When you buy 6 or more appliances, save $600.00 instantly. Are you unsure as to whether big-ticket purchases are in your budget at the moment? Appliances Connection can make your decision easier with our credit card, backed by Comenity Capital Bank. On certain eligible purchases, you’ll qualify for up to 24 months special financing. Additionally, during our Presidents Day Sale, you’ll save even more right out of the gate. When you make your first purchase with the card in an amount of $999.00 or more, we’ll give you an Appliances Connection gift card valued at 5% of your purchase (before taxes and shipping fees). Shopping with Appliances Connection, you’re not just getting access to the best home goods at the lowest prices, you’re also privy to service unparalleled in the industry. We employ over 200 people divided into teams dedicated to sales, shipping, and customer service. From helping you choose the right products, to dependably delivering your items, to providing ongoing technical support for the life of your purchase, we’ve got you covered. 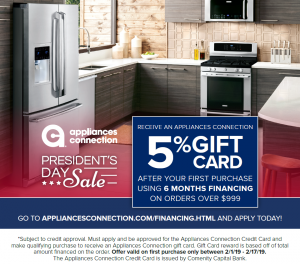 This February, save more than ever by making Appliances Connection your only destination for home goods during our 2019 Presidents Day Sale. *Buy More, Save More program does not apply to Bosch Benchmark.